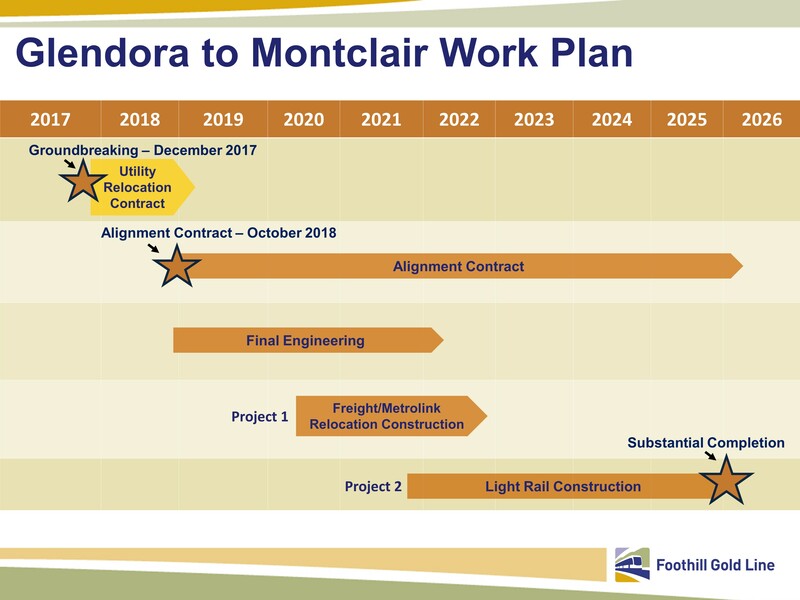 The Construction Authority completed an updated project estimate for building the Foothill Gold Line from Glendora to Montclair in 2017. The updated estimate was based on the draft advanced conceptual engineering (completed in September 2016) and subsequent constructability reviews that incorporated several constraints on construction by Metrolink and corridor cities. The reviews concluded the project would likely be built in two major construction phases – first the relocation/rebuilding of the freight and Metrolink tracks and Claremont Metrolink station and then construction of the light rail system. The detailed constructability reviews also concluded that the project will likely take an additional two years to build than assumed in preliminary estimates for the project completed earlier in the planning process. The additional construction time is due to the complicated nature of the work ahead and the fact that the project is really two projects in one, adding costs associated with the extended timeline of construction and new prevailing and minimum wage increases that will take effect during the construction period. With this more detailed understanding of the project, the project estimate was updated in 2017 to approximately $1.5 billion ($1.456 billion in Los Angeles County and $70 million to extend the line from Claremont to Montclair) from the earlier estimate of $1.216 billion. It is important to note that these are estimates. Once a design-builder is hired, the project estimate and schedule will be reviewed once again to conform with the contractor’s bid and workplan. The project is being built in Los Angeles and San Bernardino Counties and will be funded locally, with gap funds provided by the state’s SB1 program. The majority of the funds needed to complete the Los Angeles County portion will come from the Los Angeles County‘s Measure M half-cent sales tax, approved by LA County voters in November 2016, along with residual funds from Measure R not used to complete the Pasadena to Azusa segment. Additionally, in April 2018, the project received nearly $300 million from SB1, through the State of California’s Transit and Intercity Rail Capital Program. The Construction Authority is working with the San Bernardino County Transportation Authority to finalize appropriation of funds to extend the line from Claremont (in Los Angeles County) to Montclair (in San Bernardino County). The Construction Authority broke ground on the Glendora to Montclair project in December 2017. The first year of the project is being used to relocate utilities, conduct other pre-construction activities, and to hire a design-build contractor. The project schedule, also updated in January 2017, assumes that a design-build contractor will be hired in late 2018 and take about seven years to finalize design and build the project. Substantial completion is assumed in early 2026. It is important to note that these are estimates; once a design-builder is hired, the project estimate and schedule will be reviewed once again to conform with the contractor’s bid and workplan.